Pour boiling water over tomatoes in small bowl to cover. Let stand 5 minutes; drain. Chop tomatoes. 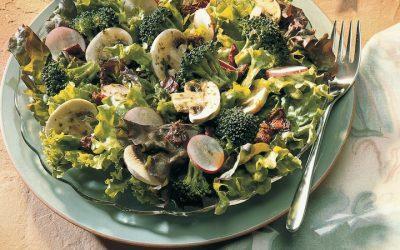 Combine tomatoes, lettuce, broccoli, mushrooms, and radishes in large salad bowl. Combine 2 tablespoons water, vinegar, oil, bouillon granules, chervil, mustard, and red pepper in jar with tight-fitting lid; shake well. Add to salad; toss gently. Serving size: 1/4 of total recipe. Exchanges per serving: 2 Vegetable.